When asking students during class to respond to multiple choice questions, you have a number of options. You can use a dedicated clicker system like iClicker where you can have students use a remote or a web-enabled device to respond. You can use a completely web-based system like Socrative. You can go the low-tech route and have students hold up one of their A through D cards. Or you can merge high-tech and low-tech and use Plickers, although this doesn’t feel low-tech at all. 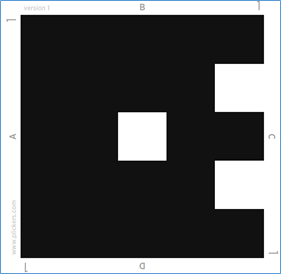 With Plickers, each student gets a unique QR code (download the PDF). The orientation of the QR code determines the student’s answer. This is card 1 showing B as an answer. Rotate to the left and C would be the student’s answer. Ask your multiple choice question, and have students respond by holding up their cards with their answer pointed up. 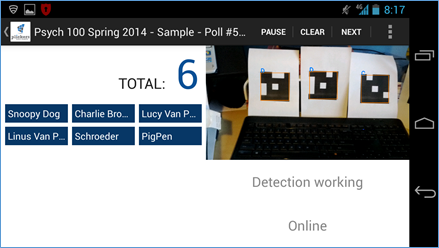 Open the Plickers app on your smartphone or tablet* (Android/iOS). If you have assigned cards to students, you’ll see the students’ names on the left. If you haven’t, you’ll see the card numbers. Notice how they are all gray. Click “scan.” Your device’s camera will come on. As you stand at the front of the room panning from one side to the other, the app will register the QR codes your students are holding up. 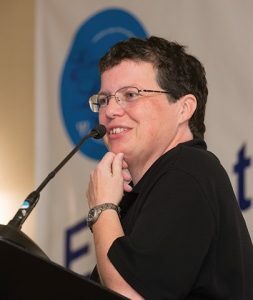 (The 5.5″x5,5″ cards are readable from 20-25 feet; I had no problem picking them up in the back of my classroom. 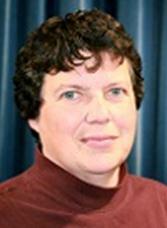 If you have a larger room, you may choose to use the bigger 8.5″x8.5″ cards.) As each code is scanned, you’ll see an orange outline appear around the QR code and the answer the student selected will appear in blue above the QR code. This is much easier to see on a tablet than on a smartphone. As each student’s response is recorded, their gray box will turn blue. If you tap the menu button (three vertical dots), you can toggle the student names off and toggle the bar graph of results on. If you want to be the only one to see this information, you can stop here. 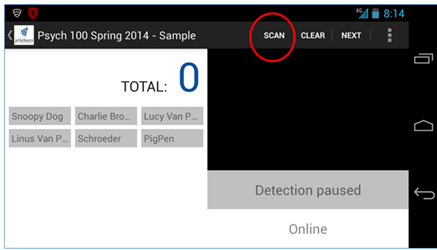 As you scan with your device, students will see their box go blue so they’ll know their response has been recorded. If you want to see how each student responded, click on the “Classes” button, select your class, then select the poll you’re interested in. Unfortunately there isn’t a way (yet?) to download the responses, but it’s easy enough to copy and paste the student responses into a spreadsheet. Creating a class and assigning cards to students. After naming your class, you can enter your students’ names. Cards will be assigned in order. (Yes, it would be cool to upload a .csv file with names and card numbers already entered, but alas, not yet.) Click on a student’s name or card number to change it. This feature is a little buggy. Sometimes the changes stick and sometimes they don’t. Navigating to another page and coming back seems to help. Note: Students can change their answers as long as you’re still scanning. 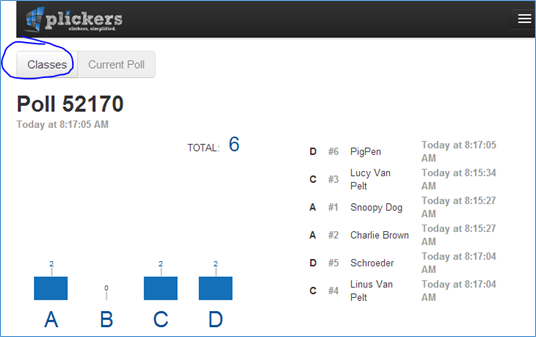 You can even switch to the graph view before you’re done scanning, and students can watch their answers come in. Let’s say, for example, you ask students how well they believe they understand a particular concept, from A (totally get it) to D (totally confused). If you have a number of students at the D end, you can leave the question running as you try a different way to help students grasp the concept. Tell students to hold up their cards as their understanding changes, and do another scan. Have the responses slid toward the A side? If so, you know you can move on. 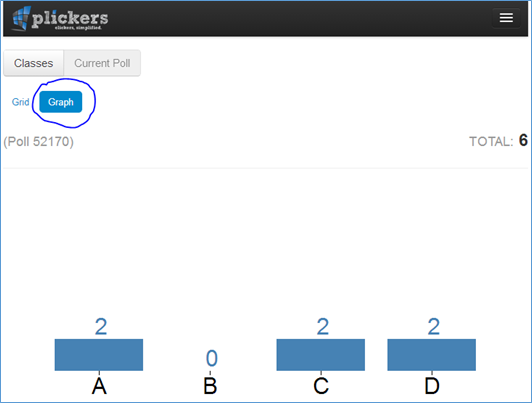 Plickers is a new product, so keep your eyes open for new features and improvements! Next Next post: Heartbleed: LastPass Can Help! To use Plickers does the teacher have to have web access at the time of scanning student responses? Or can the app be used in a classroom without Internet access? I want to use the cards for 100 students at a time. Is it possible?